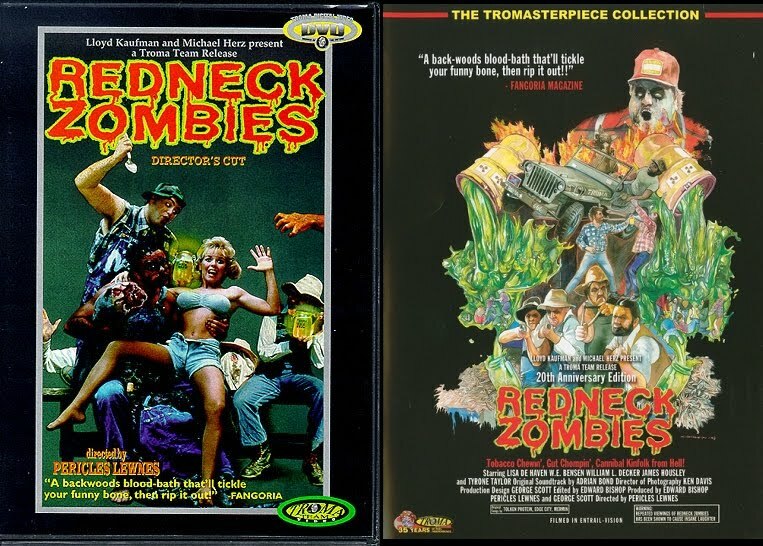 If it's tough to call Pericles Lewnes's Redneck Zombies a "zombie classic", then it should hopefully be easier to call it one of the best shot-on-video horror flicks ever made. In one of the interviews on the new Tromasterpiece DVD, Lewnes makes the point that his 1987 SoV wonder plays best to smart horror fans that understand the backbreaking rigors of such filmmaking. Not to say some horror fans are stupid, but I couldn't agree more that it's very important taking Lewnes's assertion into consideration while watching. Sure, it's a super-amateurish cheeseball, but Redneck Zombies has an undeniable soul and much like Peter Jackson's Bad Taste, Lewnes mines tremendous mileage from its dumb premise. In a way, the zeal of those involved and "fullness" Lewnes pulls from the simple story through comedy is the best testament to the film's enduring popularity. It's deceptively challenging to look past Redneck Zombies's goofy, splattery facade, but so worth it, as it speaks for itself and hits much more than misses. Most of the time, SoVs either have better cover art than their actual content or were solely made to sell the cover art to unwitting renters, but Lewnes's undead hillbilly opus delivers exactly what it promises. They're Tobacco Chewin', Gut Chompin', Cannibal Kinfolk from Hell! Concerning the freshly color-corrected transfer on the new 20th Anniversary Edition, I'm unsure I care for the brightened picture and amped up coloration. There isn't much that could be done in regards to image detail being shot on '80s-grade standard definition video (probably Betacam). Though for some reason subtle blurring has been employed, not so much noise reduction, just a smoothing which I assume was done to give the video an even look. To me, the new transfer loses some of that analog magic of the prior disc. Also the beginning text scroll and psychiatric ward location/time text has been updated with a new font. The extensive extras are what save Troma's new disc. Just a fantastic package with a Lewnes/producer Ed Bishop commentary, a bunch of interview segments (including a still funny Ferd Mertz), deleted scenes, trailers (including one for Lewnes's Loop), and a Lloyd Kaufman/Pericles Lewnes "Kaufman's Kultural Korner" opening segment. Not to mention the CD soundtrack. The Tromasterpiece looks overly yellow. The original disc has much more natural colors. I'll just continue to hang onto my VHS for now. The new release has the "I Ain't Got No Shoes" scene in its entirety. Not to mention that got rid of that annoting audio hiss, that was on the previous release.